Looking for a great way to take that summer outfit from day to dusk with a touch of Boho styling? I have a couple of quick knit accessories that will help you do just that. The multi-way scarf, belt, headband will give you a number of quick ways to adapt your look. The corset style belt with its lace up fastening will give you some killer curves if worn at the waist, or wear around the hips for a more relaxed fit. The corset is written in a large range of sizes from UK size 6 to 24. Both pieces are knit using Sirdar Soukie, this is a DK weight yarn. It is a blend of polyester, acrylic and cotton with sequins scattered throughout. We’re closer still to Christmas, so once you’re done creating your Halloween decorations you still have plenty of time to get hooking on this festive crochet table runner featured in issue 86 of Let’s Knit magazine. “Christmas Feast” uses a cotton-blend yarn that has been plied with a thread of metallic silver, giving it a lovely holiday feel. Consisting of individual squares, it is a great pattern to suit any size (and shape) of table. You can download Issue 86 of Let’s Knit Magazine here. 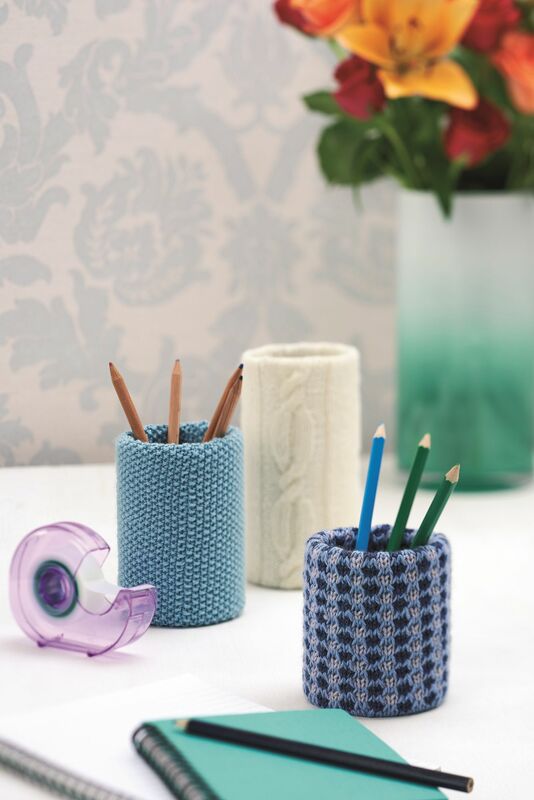 Pringle Tube to Knitted Desk Tidy, why not? These cute storage tins are a great way to practice your skills and maybe try a new one! The checked jar is created by slipping stitches, this means you are only ever working with one colour per row, awesome! You can download Issue 83 of Let’s Knit Magazine here. Plain kitchen clock to knitted rustic wall art – Easy! This post comes with a warning, once you have knitted completed this project nothing in your home will be safe! Knitting i-cord is simple and before you know it you will be yarn bombing mirrors, frames and more. 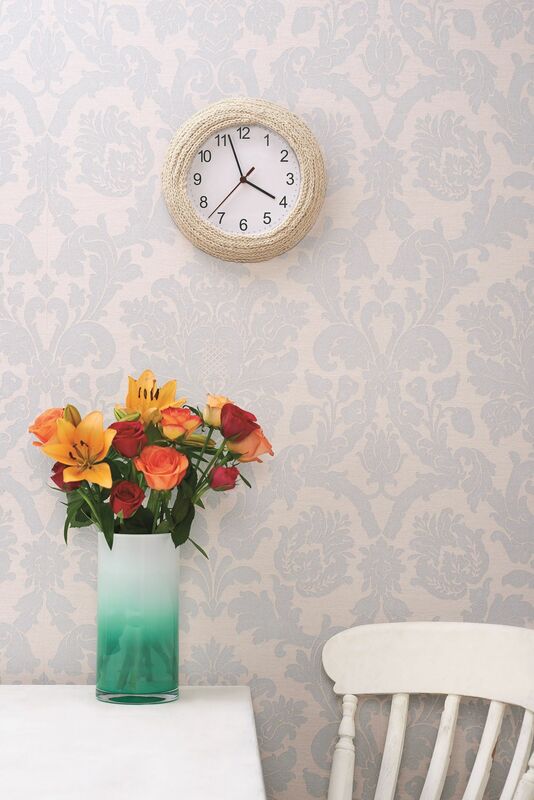 This plain kitchen clock is given a make-over using household string and a glue gun. I would love to see what else you yarn bomb with this technique over on my Facebook page. You can download your copy of Issue 83 of Let’s Knit Magazine here. In this months issue, Let’s Knit magazine is commemorating the 100th Anniversary of World War I by supporting The Royal British Legion. The cover mounted kit comes with two exclusive patterns created by Jane. ‘Flanders Fields’ is a vintage style tea cosy with a poppy motif. The pattern includes instructions for both intarsia or swiss-darning the motif. The second pattern uses the remaining yarn to create two poppies with which to make commemorative brooches. With the hot weather it seems like November is far away, but it’s not too early to get prepared. Please do knit the patterns and perhaps sell them in support of The Royal British Legion. 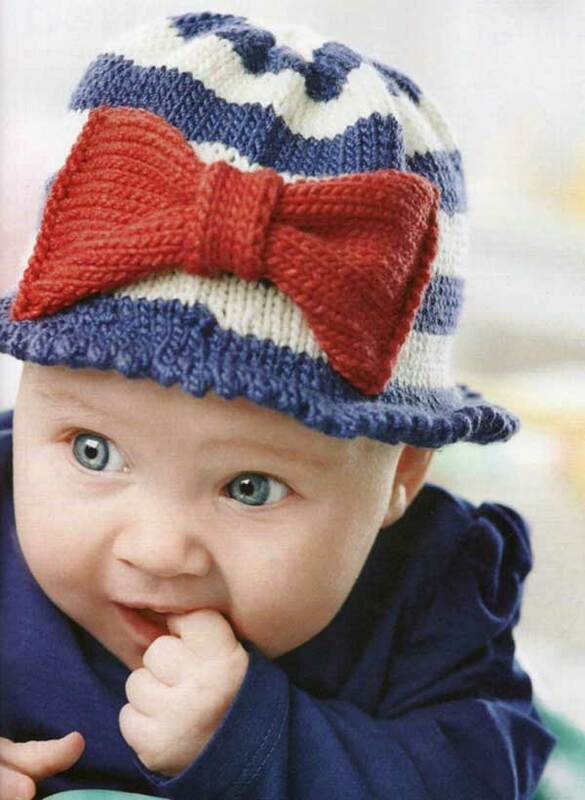 Since the sun has decided to make a decent show of it this year, what better to protect a little-ones head than a cute nautical-style hat? It certainly wasn’t such appropriate weather when this knit was in the making. Knitted in Sublime Baby Cashmere Merino Silk DK, the natural fibres feel lovely, and being machine washable its practical too, with a beautiful range of shades to suit your child’s wardrobe. Jane has also been enjoying mixing her needle crafts (I hear those gasps at the back!) and this hat starts with a… crochet chain! Honestly, I’m not even sure what I’m saying, I just have a vague understanding that crochet and knitting is like… erm… gamers and sunshine; you don’t often find them together, and lovers of one are not usually lovers of the other. And on that note, back to my cave I go. I’ve saved up from my birthday and Father’s Day so I can be ready for what we call ‘the Steam Summer Sale’, which is a bit like a Craftsy sale but less frequent. And please – do post images of your knits to Jane’s Facebook page, or share links in the comments or on Twitter!